Hooray! Thank goodness for this news. I must admit that when I saw this piece of news, I was excited. I have always wanted to be able to eat pizza guilt free. And now I can, right!? Congress is now saying that pizza can be classified as a vegetable in school lunches. Earlier this year the Agriculture Department proposed new regulations that were supposed to limit the amount of potatoes and change other foods that were allowed into school lunches. A final revision of the bill has removed these limits and has included allowing 2 tablespoons of tomato paste to be counted as a vegetable. Originally, the bill wanted to include 1/2 a cup of tomato paste as a serving of vegetables, but this is too much to be on a single serving of pizza. Companies that produce frozen pizzas for schools, the salt industry and potato growers requested the changes (surprise, surprise). Food companies who have fought the USDA standards say they were too strict and neglected the nutrients that potatoes, other starchy vegetables and tomato paste do offer. Specifically, the revisions in the bill are listed below. Block the Agriculture Department from limiting starchy vegetables, including corn and peas, to two servings a week. The rule was intended to cut down on french fries, which some schools serve daily. Allow USDA to count two tablespoons of tomato paste as a vegetable, as it does now. The department had attempted to require that only a half-cup of tomato paste could be considered a vegetable — too much to put on a pizza. Federally subsidized lunches must have a certain number of vegetables to be served. Require further study on long-term sodium reduction requirements set forth by the USDA guidelines. Require USDA to define “whole grains” before they regulate them. The rules would require schools to use more whole grains. It baffles me that limiting starchy vegetables is a point of contention. First of all, they shouldn’t be classified as vegetables. It gives them credit as health food where no credit is due. Secondly, corn is not a vegetable! It is a grain. Period. Thirdly, it is a proven fact that high levels of starch in the diet lead to poor health outcomes. It has been linked to everything from heart disease to Alzheimer’s. Why are we continuing to allow it in our school lunches? The answer is short and political. It has everything to do with money and lobbying power and nothing to do with what is actually in the best interests of the health of the children in this country. By allowing tomato paste to be classified as a vegetable it essentially makes pizza a vegetable. Where else are children going to get tomato paste in their school lunch? Pizza is already too prevalent in school lunches. I remember when I was in school pizza was served everyday as an alternative to the planned meal available AND it was the main meal served every Friday. “This agreement ensures that nutrient-rich vegetables such as potatoes, corn and peas will remain part of a balanced, healthy diet in federally funded school meals and recognizes the significant amounts of potassium, fiber and vitamins A and C provided by tomato paste, ensuring that students may continue to enjoy healthy meals such as pizza and pasta,” said Kraig Naasz, president of the American Frozen Food Institute. ‘Healthy meals such as pizza and pasta! ?’ Did I read that correctly? Obviously the American Frozen Food Institute is not in the business of trying to help people be healthy, but I can’t believe Mr. Naasz could write that statement with a straight face. He might as well have said the sky is green! That would have been just as true as his statement on healthy foods. The lobby power of big industry groups like the one above is too great and their interests are only in preserving their share of the market to make money. I wish people in Congress would take some initiative and vote for what they believe is right for this country and not based on a powerful lobby group that only has their interests at heart. – Clear Springs Foods Inc.
James E. Matthews, Jr. – H.J. Heinz Co.
– National Frozen Foods Corp.
Peter Cokinos – Little Lady Foods, Inc.
Wesley Eubanks - The Pictsweet Co.
– Firestone Pacific Foods Inc.
Steve Lezman – Tropicana Products Inc.
– Better Baked Foods, Inc.
Now are we really surprised they would lobby to have healthy foods removed from school lunches? Above are members of the largest junk food companies in the world. It’s criminal that we let our government be run by special interest groups like this. Another part of the problem is that some will read the above statement by the America Frozen Food Institute and actually believe pizza and pasta are wholesome, nutritious meals when nothing could be further from the truth. We need better education on what is healthy and what is not. Until then, special interest groups like the American Frozen Food Institute, the grain industry and the potato industry will continue to guide what we feed our children in schools. You can bet they won’t be asking to include more vegetables anytime soon. I recently read a great editorial blog from the Huffington Post. It made the great argument that soda in this country is being subsidized by the government. It’s not being subsidized in the traditional way that, say, corn is, but that’s semantics. The way it is being subsidized is by allowing people to use the Supplemental Nutritional Assistance Program (formally known as food stamps) to buy sugary soda with their money provided by tax payers. The government doesn’t allow SNAP to be used to buy alcohol or tobacco so why would it let people buy a product that is just as bad for your health as those two are? Below is the entire blog. It’s written by Michael F. Jacobson Ph.D., Executive Director, Center for Science in the Public Interest. Let me know what you think. Forty-three million Americans depend on the Supplemental Nutritional Assistance Program, or SNAP, to help provide the foods they need for good health. SNAP (formerly known as Food Stamps) is a critically important part of the government’s safety net and has become even more vital to low-income families since the economic downturn. The program distributes benefits via an Electronic Benefits Card that can be swiped at participating supermarkets and, increasingly, farmer’s markets. But the benefits cannot be used to purchase tobacco, alcoholic beverages, supplement pills, hot prepared foods, and non-food items. For those products, SNAP recipients must use their own money. Unfortunately, huge amounts of SNAP dollars are used to purchase carbonated soft drinks and other sugar-sweetened beverages. Already among the least expensive foods in the supermarket, these drinks are nutritionally worthless and promote obesity, diabetes and other diseases that have a disproportionate impact on low-income Americans. One supermarket executive shared with me confidentially that carbonated soft drinks accounted for 6.2 percent of the grocery bills of SNAP recipients. Considering that recipients will spend $65 billion of SNAP benefits on groceries in 2010, that works out to around $4 billion taxpayer dollars that go toward the purchase of soda pop. And that sum doesn’t include non-carbonated soft drinks, which are just as nutritionally poor, such as Gatorade, fruit-flavored drinks with little or no juice, and so on. Though excluding sugar-sweetened beverages from SNAP would be controversial, setting nutrition standards for government food programs is hardly new. The school lunch and breakfast programs administered by USDA comply with strict nutrition standards that exclude soda and junk food, as does the Women, Infants and Children (WIC) program, which is limited to foods that have specific health benefits for pregnant and breastfeeding women and young children. The federal government should be doing everything it can to reduce soda consumption, not encouraging it. 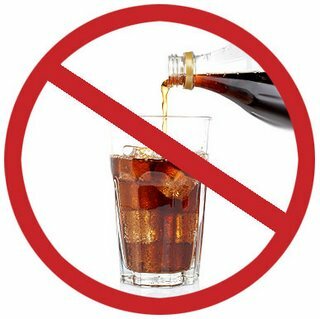 In fact, the government’s 2010 Dietary Guidelines Advisory Committee bluntly stated, “avoid sugar-sweetened beverages.” There would be stiff opposition to eliminating soda from SNAP from several quarters, and the soft drink industry would certainly pull out all the stops. That’s what happened when the idea of a penny-per-ounce excise tax on soda was floated in Congress and in the New York State legislature. And Coca-Cola in particular has a long track record of using its “philanthropy” as a way of buying new friends and silencing critics. A less controversial way to use the SNAP program to promote healthier diets would be to provide recipients with a financial incentive to purchase fruits, vegetables and whole grains. One easy way would be to provide a credit of say, 30 extra cents, for every dollar spent on healthy foods. I suspect that most people would agree that it makes sense not to allow federal nutrition assistance funds to purchase Budweiser and Marlboros, and reasonable people could disagree on where exactly to draw the line. But Coca-Cola, Pepsi, Mountain Dew, and other soft drinks make no positive contribution to the diet, promote expensive and debilitating diseases, and make our already stark health disparities worse. I would draw the line at soda. This is a product–and an industry–that needs to be taxed, not subsidized. 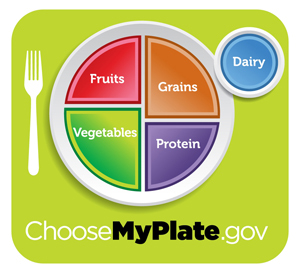 March is National Nutrition Month. It is an event sponsored by the American Dietetic Association in an effort to raise awareness about nutrition. The idea of a National Nutritional Month is a good one, however, the ADA still insists that low fat is a must. Let’s have a look at the paradox of the food guide pyramid and why it is actually an unhealthy way to eat. Above is the most recent food guide pyramid from the government. They have changed the way it looks in order to try and keep up with recent research. No longer do you see the grains at the “base” of the pyramid as you did in the old one. Now you see it on the left and as the first “step” which still suggests it should be the largest part of your nutritional day. From the governmental website www.mypyramid.gov you can find their suggestions regarding each category in the pyramid. Let’s start with grains. They recommend that half, only half, of your grain serving be whole. The other half? I guess it’s o.k. to get that from simple and refined grains. They recommend eating breads and pastas every day to maintain health simply because they are low fat. What they fail to inform the public is that these kinds of foods cause massive amounts of insulin to be released and over time this causes obesity and diabetes. I can’t tell you how many patients I have that want to lose weight and all they eat are “low fat” carbohydrates. Their information on vegetables and fruits is actually o.k. It’s not that hard to say ‘eat more.’ The one exception to their fruit recommendations that I have is that they say to eat fruit any way you can get it including canned or dried. Canned fruits are often in a sugary syrup to maintain flavor and this is extremely high in terms of glycemic load. Sugar is sugar and just because it comes from a fruit doesn’t mean it’s healthy. Dried fruit is acceptable once in a while, but drying a fruit raises its glycemic load. The information is only a little misleading in this area of the pyramid. If you look at the new pyramid you can see a small yellow sliver in there somewhere. It is so small that it does not have a correlating category listed at the bottom. This is supposed to be your entire serving of oils for the day? This is a major problem. The healthy oils such as olive oil, coconut oil, nuts, seeds and fish are unbelievably good for your health. They promote heart health, reduce inflammation, provide a great source of healthy energy and increasing them reduces the carbohydrate intake one consumes. Primitive cultures have been using fats for thousands of years as a source of energy and nutrition. These cultures, while few and far between now, are not the ones that have the epidemics of heart disease, diabetes and obesity that Western cultures do. The difference is the amount of carbohydrate that Western cultures consume on a daily basis. The problem with the current food guide is that all people see is that fat is bad. It’s so bad it fact that it barely deserves a place in the pyramid. That’s what the diagram suggests anyway. The next section is also very misleading. This section is entitled simply milk. If milk is going to be consumed it should be raw. Pasteurization destroys any health benefits outside of the calcium that one might get from milk. They also recommend you drink skim milk which just makes the sugars in the milk more of a problem. Milk is also highly allergenic. There are many people that are allergic to casein, the protein in milk. It is especially bad for children. The protein in milk has been linked to increases in the number of kids with diabetes and autism. Asking America to drink more milk could be a worse idea. If you’re going to consume milk, make sure it is raw and whole. That is the only way to benefit from milk. It should still be a small portion of what you have in a day. The next section is meats and beans. This section is also o.k. with one exception. They still can’t get away from the the fact that they want you to go low fat. They stress lean meats in this section. While lean meats are good, don’t shy away from cuts of meat with a little more fat in them. Go ahead and have that steak. The benefits of the fats in the cut far outweigh any negative. This steak only becomes problematic when you combine it with steak fries. Keep the carbohydrate count low and the fats and oils from your steak only help you. The food guide pyramid is designed on flawed data and therefore is flawed itself. All fats are not bad, as this pyramid suggests. There are many fats that are actually very good for you, but you’d never know it looking at the schematic they have designed. It places entirely too much emphasis on carbohydrates which are known to contribute to inflammation, diabetes and obesity. To make this more appropriate the healthy fats must be emphasized more and carbohydrates much less.